Perfect Red Velvet Cake – remember these from childhood? 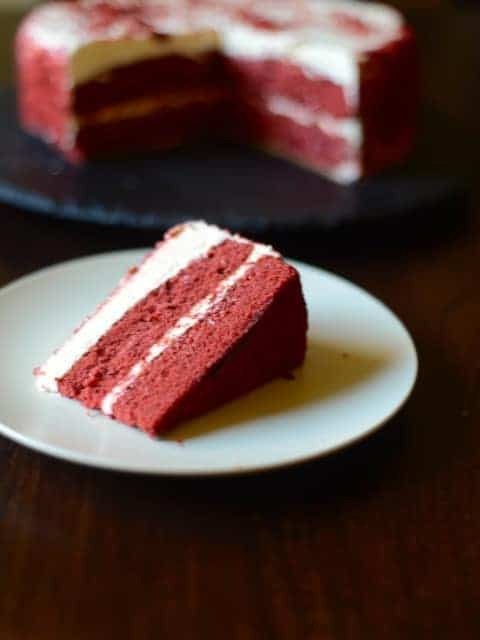 Home » Cake Recipes » Perfect Red Velvet Cake – remember these from childhood? A dense chocolate cake is layered with cream cheese frosting. What could be better? Do not let the the layers intimidate you, this is a wonderful cake and it shouldn’t be missed. Thanks to sarbrand for sharing this cake recipe. You can make the most perfect red velvet cake ever with this recipe. Pour into two greased and floured 9-inch pans and bake in the preheated 350-degree oven for 25-30 minutes. Cool and frost. (For three layer cake, use three 8" pans and cook for 20minutes.) In a medium bowl, cream together the cold cream cheeses and butter until creamy. Mix in the vanilla, then gradually stir in the confectioners' sugar. Store in the refrigerator after use. how do I measure this recipe if im just making 6″x3″ round pan? It is 4 ounces of butter. I have to say I love red velvet cake and this recipe seems like a easy one to follow. Will definitely give it a try! I would imagine the recipe posted calls for 3 one ounce bottles of food coloring. This particular recipe calls for only 2 ounces (1/4 cup) and 2 sticks (1 cup) of butter. Good luck. How many ounces are each bottle of red food coloring? Generally the bottles will say on them, I don’t know if you bought your bottle individually or if you are talking about coloring in a set.